Re: JD's 3E Thread: The Pudding Man!!! He does sound like a batman enemy doesn't he?! Enemy: The Police. : More than any other member of the team, the Gingerbread man , is a wanted killer. Quirk: Psychotic. : Jack Riggs is something of a fool. A trickster, Manipulator, and all around jokester. He has a tendency to talk in rhyme. A clown in make up, and outfit that looks like the gingerbread man. Jack Riggs used to be The Pudding Man's assistance. But when one of his his cullinary inventions went wrong, Jack was transformed and became the Gingerbread Man. He also lost some of his insanity in the process. The gingerbread man, is perhaps one of the most dangerous of the bunch. His abilities make him extremely capable at mayhem and murder. Saves to Defenses: Since saving throws can get out of hand in D&D in extreme proportions. Ive decided to treat these like "levels" before converting to a rank. ** Do not include Shield bonuses. *** This bonus is added onto a weapons ( or shields) normal ranks. So a +2 sword that does 1d8 damage in D&D does Rank 4 damage in M&M. Fighting Score & Ranged Combat: I usually base this off the creatures HD or Base Attack bonus which ever is lower. And I usually assume that their ranged combat, is 2/3rds this value. Converting Multi Classed Characters: To find the true Hit Dice value before converting. Take your highest level class as your base. Then for every 3 levels in other classes add 1 to this. Greater HitDice: Some monsters/classes use a D10 or a D12 for their hitdice. To represent their increased potentials. Grant them either Increased Stamina, or the protection power. D10 is 1 rank, D12 is 2 ranks. 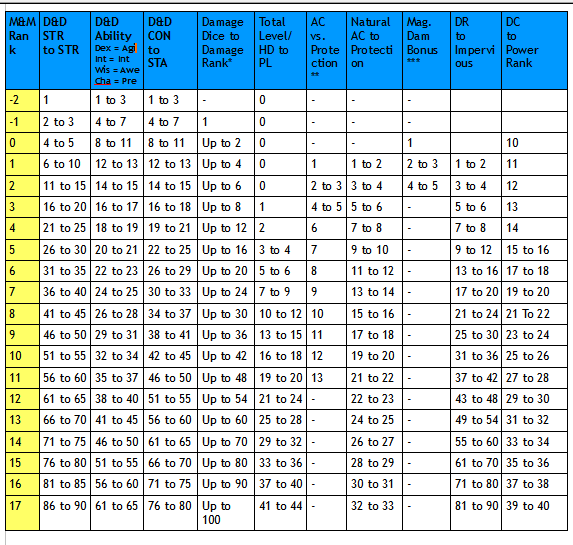 Damage Resistance: Use the last column on the chart above for converting into Impervious ratings. I've decided for converting Damage Resistance to specific attacks. Should a monster have a DR of 20 or greater, the GM can opt to just give the creature half save immunities to the specific resistances. DR's of 40 or higher against specific attacks, can be full Immunities. But this is up to you. The main reason to keep there from being incredibly high Impervious ratings. Skill Ranks: Skill Ranks convert straight across the board. Though you may want to cut back on the number skills, to cut down on costs. It's up to you. Saving Throws to Defense: Since saving throws can get out of hand in D&D in extreme proportions. Ive decided to treat these like "levels" before converting to a rank. Making Spells Generic? : A quick rule, to converting spells. If you don't want to convert a bunch of spells into the game. Do this. The player has an aray of points equal to their caster level x 2. And has a number of spells 1/4th the amount of total spells castable (except for the 0 level spells). Let's put this to a test. Any SRD requests? Cool stuff JD. Hmm something from the SRD. Well I always liked Chain Devils. 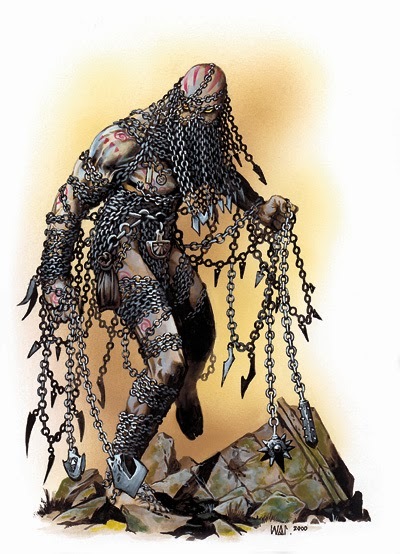 Or perhaps a Balor. Outsider. An outsider killed outside of its own native plane will die, and cannot be resurrected. Vulnerable. Silver and Good Weapons, bypass the Chain Devils Protection and Impervious ranks. I'd be interesting to see builds for the Circle of Eight. In my searching I've only ever seen 1 or 2 of the eight even stated up. But lets see we got Mordenkainen, Bigby, Bucknard, Drawmij, Leomund, Nystul, Otto, and Rary. Last edited by JoshuaDunlow on Thu Mar 06, 2014 9:17 am, edited 2 times in total. I remember an adventure that had they all stated up for second edition d&d. Will have to look and get the name of it again. There were times when they had different members, with the additional members being Tenser, Otiluke, Jallarzi, Warnes, Alhamazad and Theodain. You can find some 3.5e stats here. Oh nice, that will help. Well you have to remember, these stats are assumed and creative takes on the famous characters. Gygax never really had never been forthcoming about the abilities of his prized inner circle. But I wont be very literal with these conversions myself. Converting every little detail about an established PC, would be counter productive. I personally ignore 3rd edition material except where I can convert it back to AD&D, and admittedly a 27th level wizard is pretty easy to convert. Cool Chain Devil. I haven't studied your conversion method that close but the results look good. I imagine it could work for Pathfinder too for the most part.